Your baby’s skin is burning up and you know you’re in for a long night. So what can you do to make your baby more comfortable and boost their immune system at the same time? Read on. Last week, my son had his first fever; he’s now 11-months old. I’ve been waiting for it to happen – it had to happen at some point right? And when it did it was quite scary. Ajax started burning up about 4pm last Monday. He was not himself; weak, not interested in food, not interested in playing. I called the NHS hotline, 111, for some advice ( a good number to remember for non-emergency situations) and they assured me that 38.2 C was OK and to keep an eye on him. So when should you seek medical advice? *When your child displays other signs of being unwell such as persistent vomiting, floppiness or drowsiness. For the full list you can go to the NHS advice page. However when the temperature is not extreme and your child does not seem distressed, there is no need to give Paracetamol… or sit for hours at your local GP surgery (we’ve all been there, wishing we’d grabbed a snack for baby before we dashed out the door). But what can you do to soothe your little one and help boost their natural defences? Food will naturally lower a fever. On Monday night I gave Ajax a banana (after he refused his normal dinner). Before the banana his fever was 38.2 and about 20 minutes later it was 37.4. But you don’t need to force food, just a few bites of toast or better still a few sips of bone broth can help. Luckily I had some bone broth brewing on the stove when Ajax fell ill; I usually roast a chicken Sunday night and make a broth with the carcass the next day. So why is it such a good food for baby? When your body is working overtime to fight an infection you don’t want to overload the metabolism with hard to digest food and bone broth is super easy to digest. 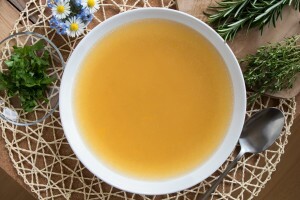 In addition, bone broth is rich in the amino acid glycine, which is really important for detoxification. You can read more about feeding your baby bone broth here. When you get out of a warm bath, your temperature naturally drops. So it’s great to pop your little one in a warm bath before bed. A cold bath, although it might seem to make sense when your child is burning up, can actually shock the body into trying to raise the internal temperature even more. You could also try adding 1 cup of apple cider vinegar to the bath; an old wives tale for drawing out a fever naturally – not scientific but certainly not harmful! ‘This literally was the remedy that kept my kids well and me sane, a total godsend,’ says Naturopathic Iridologist Lucinda Miller (NatureDoc.co.uk). When Ajax was 8 weeks old another leading Naturopath recommend this remedy to me and I’ve been using it ever since. First for colic, then for teething and last week – fever. It contains a combination of homeopathic remedies including Belladonna – well known for use in fever as well as chamomile, which you’ll find in common chemist teething remedies. 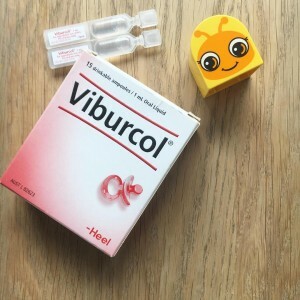 I gave Ajax one whole ampoule of Viburcol in his bottle when he went to bed and it really helped settle him. When he woke up again, two hours later, I did decide to give him a small dose of Calpol as I was worried he was in pain. But this was an error! His temperature dropped so much that he was left cold and shivering and awake until 6 in the morning. Lesson learned! Next time I’m sticking with Viburcol, which you can access through your local Naturopath. By the next morning Ajax was much better. I kept offering him bone broth with meals and he quickly regained his appetite.